Nepal Eye Hospital (Nepal Aakha Aspataal) Tripureshwar Kathmandu published a vacancy announcement for four Ophthalmologist and one General Physician at Gorakhapatra on 2075/04/29. The last date to apply for these posts is 2075/05/27. According to their requirement, qualified candidates can apply for these post. 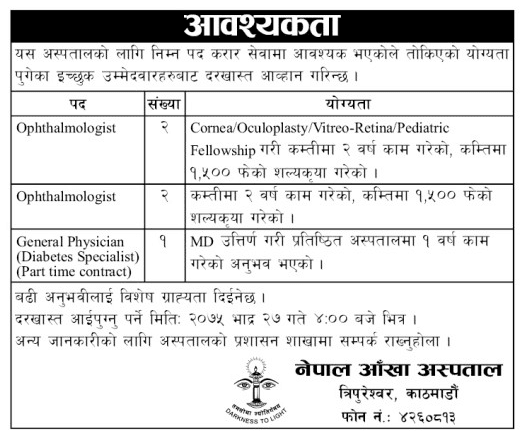 Check the Nepal Eye Hospital Vacancy Announcement for Ophthalmologist and General Physician below.